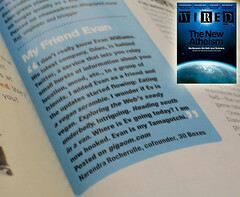 Published in Wired Magazine! | No Soap, Radio! Before you mistake this for a fit of self-promotion, I’ll preface by saying that I began reading Wired Magazine shortly after its inception way back in 1992. During the last 13 years, I have submitted query letters, letters to the editor, jargon, comments, and yes, a job application! Never heard a thing from them. Imagine my surprise when I got an email out of the blue from someone at Wired asking if they could excerpt a blog post. My first thought was: cruel hoax. But it is true, my little trifle about Twitter which Om Malik was kind enough to include on gigaom has actually made it to print. If I had any doubts about the impact of blogging, they are a faint memory. Of course, as fate would have it, my wife was quoted in Time Magazine last week, go figure.